Last night we completed a two week American Civil Ware Fire and Fury game over at the ‘Woking Shed’. 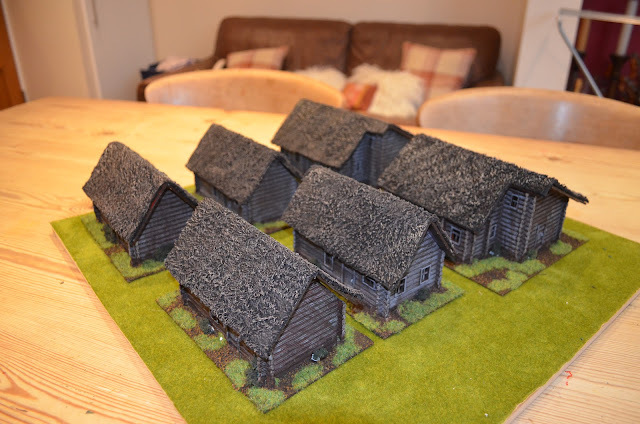 All the figures, terrain and scenario were put together by my good friend Mark, so all credit to him for an excellent engagement. For those of you who will ask the scale is 15mm. The scenario was quite straight forward a numerically stronger Union Army had to capture the supply base (centred on a church) and secure the supplies (wagons). The Union force consisted of four Divisions – each of about 5 brigades with Artillery support. The Union had one Cavalry brigade under the command of a certain General Custer. In opposition were four Confederate brigades with around a third fewer troops. These were in the main defending the Supply depot and the cross roads to the East. The Rebels were required to evacuate the supply depot (via the Wagons) if threatened and move the convoy off the road exiting east. This was not revealed to the Union players. The Union forces were distributed across a broad front. One division was tasked to march to the Eastern crossroads and engage the Confederates in defence. A large and elite Union brigade along with the Cavalry brigade were sent forward on the right flank to threaten the western end of the supply depot. The final Union brigades were told to advance on the centre of the defended position. Not knowing how the defenders would respond we adopted a simple strategy of engagement across the whole flank. One of the central divisions was held back in reserve available to reinforce either flank or centre if required. Starting with the crossroads in the East, the Union’s Zouaves pushed forward and quickly came to blows with an equally matched Rebel brigade. Quite quickly the assault was repelled and the Union forces were driven back. By the end of the game this division had been virtually wiped out for little confederate loss of life. This served as a timely reminder of how brutal these rules can be and on the second evening I had learned my lesson. 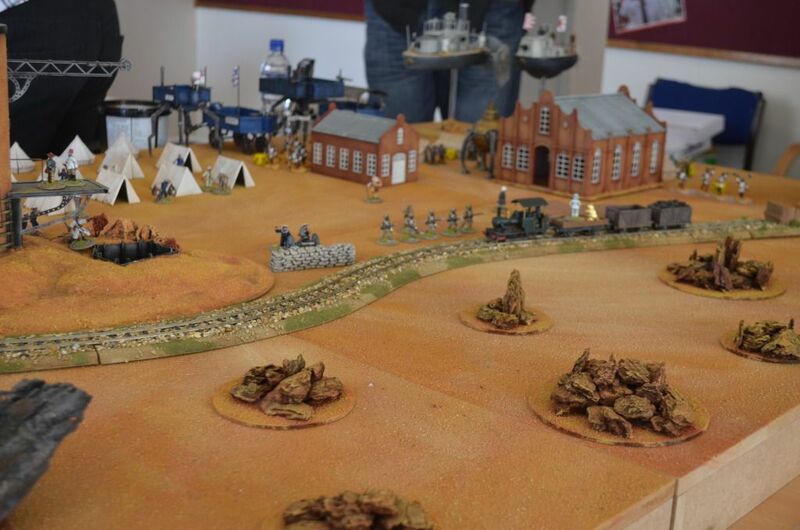 Meanwhile the Centre brigades pushed forward but were held back until the right flank had engaged the supply depot. The US Cavalry reached the edge of the depot in quick fashion, jumped from the horses and took cover behind the walls. The infantry units to the right suffered a series of disastrous manoeuvre roles and slowly crawled across the field. With sporadic firing, few casualties the Rebels held the upper hand on the close of the first night. We were all set for a thrilling finale. Staying true to our original strategy the Union would continue its assault. Unfortunately I was now commanding the entire Union army so I could only blame myself if it all went wrong. Starting on the left flank I had to plug the gap after my division went missing in action !. Fortunately the reserve from the centre were in place to repel the confederates charge. Well place artillery decimated one rebel brigade and a series of hand to hand engagements saw the rebels slink off into the woods. The Left flank had held. Meanwhile I chose to seize the initiative with the US Cavalry. They had for too long been skulking behind the walls of the supply depot. They were needed to chase down the fleeing wagon. Mounting up the proceeded to make their way round the flank of the confederate forces. Their positions were quickly filled with the Elite Union brigade who finally decided to march to the guns. It was finally time for the centre to advance, despite marching into well defended troops and taking raking fire from confederate forces the numbers began to tell and Johnny Reb began to retreat. Could they get the wagons off to safety? The final few turns of the night saw the Union forces plough into the remnants of the rebel forces. Fierce melees were breaking out all around the supply depot. Retreating in good order the Rebels formed up in the wake of the retreating wagons. A union Cavalry charge ! The US cavalry rather than charging headlong into the well formed defensive ranks ploughed into the flank of a retreating brigade, a second cavalry brigade was on its way in support. The wagons were escaping but the Union forces were closing fast. Time unfortunately got in the way and we called to a close a great battle. Totting up the losses and reviewing the disposition of troops the Union would probably win. They had the initiative, had more fresh units on the board and had reserves of cavalry to capture the wagon supplies, however they had been given a very bloody nose. At the end of day 1 I could not see how the Union could win but this was a game where the numbers counted. Great fun, great company and a good result for the Union. Thanks to mark for making this happen. Look forward to the next one ! On Saturday I was delighted to attend Matakashi’s Tea Party in Woking. This is I believe the second event, the first being last year when he celebrated his 50th birthday. As a ‘newbie’ I was introduced to several familiar names from the Lead Adventure Forum. So it was nice to put some faces and real names to these folks. There were four games being played and I tried to get some pictures covering all of these. First up was a Medieval War of the Roses engagement being fought over a ford. The scenery and figures were beautiful. Second up was a Gaslight Victorian Science Fiction game being played out on the deserts of Mars. 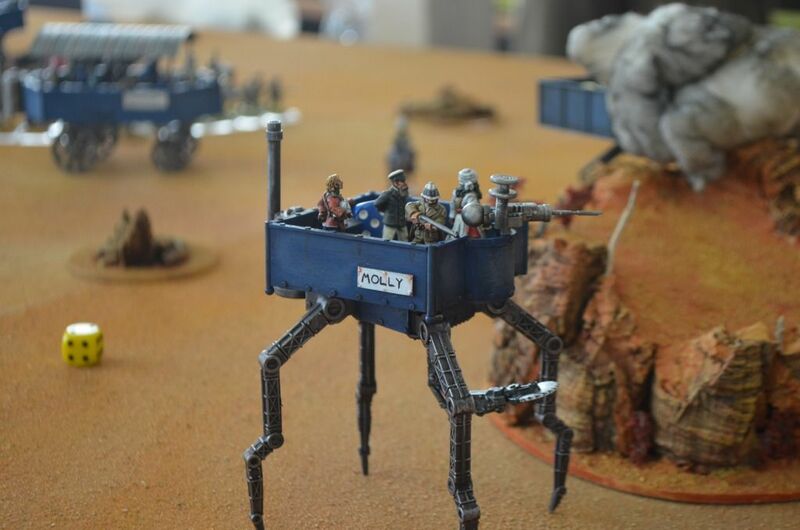 Again all credit to the folks involved for some superb terrain and wonderful scratchbuilt vehicles. I understand from the guys that were playing that their ‘Martians’ will soon be released as a range of 28mm figures, good luck to them in their new venture. I was fortunate to play a few games of the Strange Aeons rule set. These are loosely based around adventurers & investigator preventing the Cthulu mythos from prevailing. 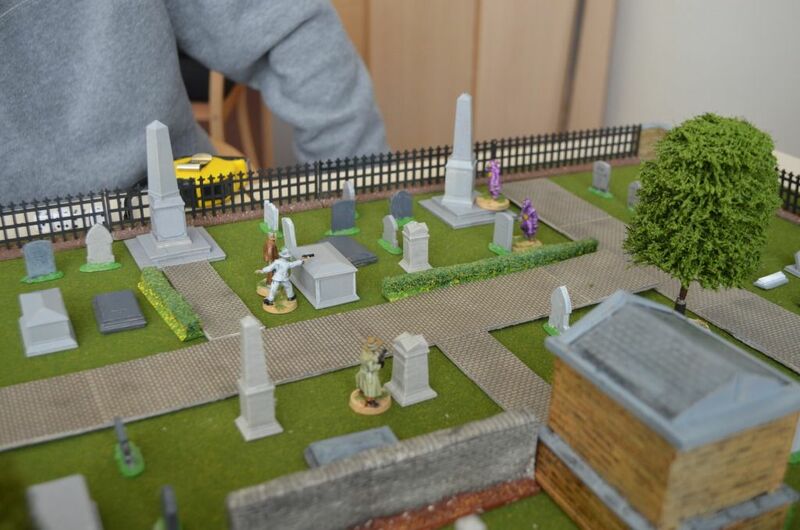 The setting for Saturday was a small but excellent graveyard layout. 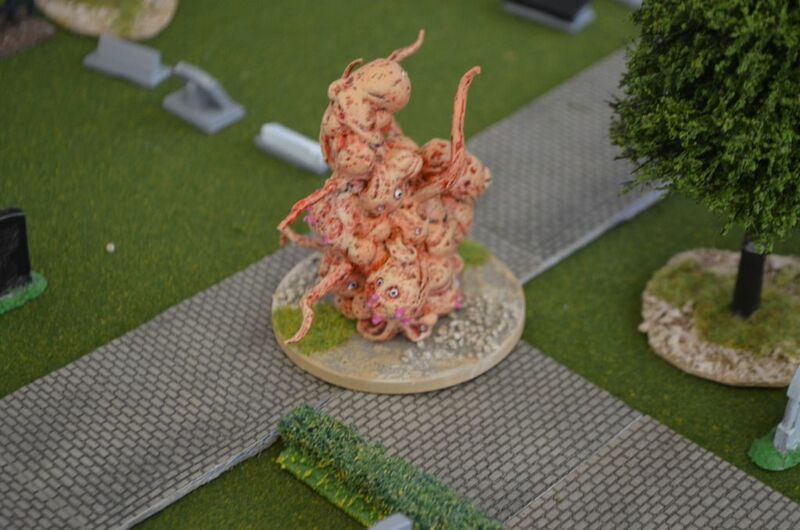 In my first two games I played the cultists and their raised Zombies. The first game was lost to the Tommy gun wielding Investigators the second I took revenge. Later in the afternoon I swapped sides playing the investigators who were facing a creature of nameless description. Despite one member of the team falling under the command of said creature it was rapidly despatched back to the pits of hell. Lucky dice rolls won the day. Finally I was involved in several games of Matakashis excellent Zulu project. In the morning we played the siege of Rourkes Drift and when it came to my turn to hold the defences my Martin-Henry’s did not let me down. A couple of nervous moments came on early on but the redcoats fought to win the day. In the afternoon we played out a series of Zulu ambushes on a British column. 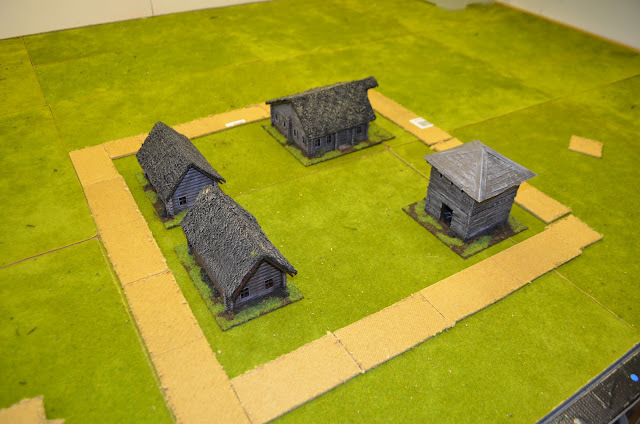 For three games on the trot the Zulus kept winning but eventually determination and a slight change of rules allowed the column to finally complete the task. My thanks to Matakashi, his wife and his daughter for an excellent day, great company and good fun. Next year, if invited I will put on a game. 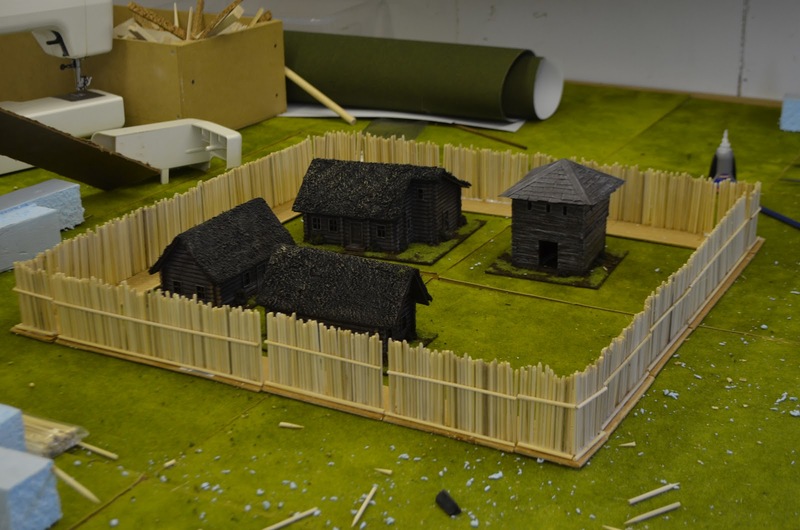 Last week I was prompted by my fellow gamers to think about building a stockade for our M&T games so Fort William-Martin (my middle names) would be built. 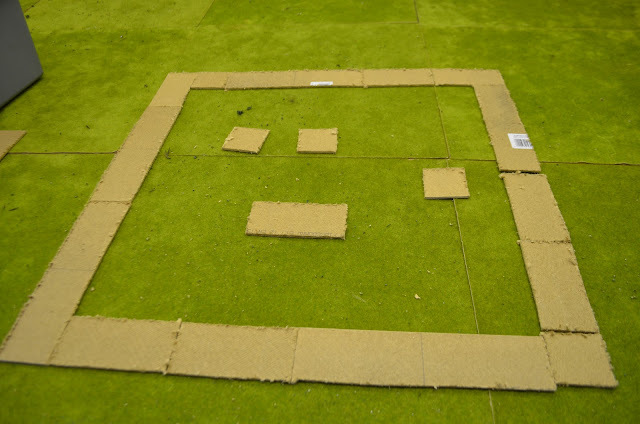 I wanted flexibility (both in terms of storage and layout) for the design so determined that the wall sections would be built in two lengths (12.5cm and 25cm). Corner sections would be 6cm x 6cm. 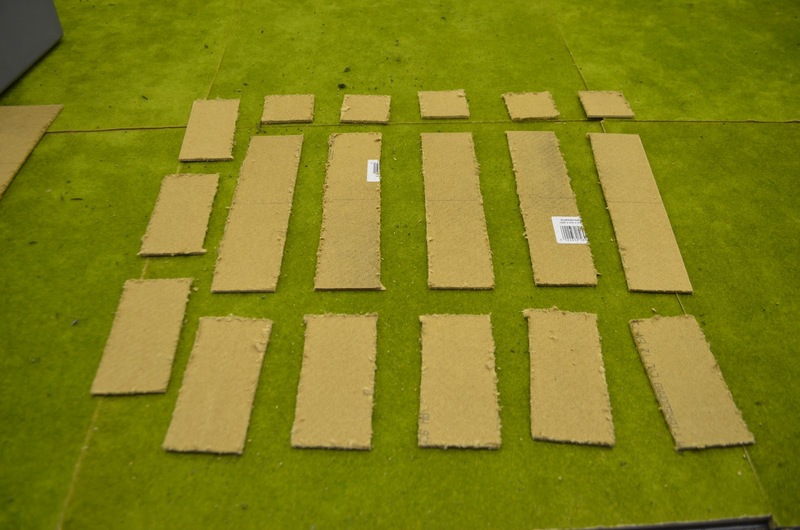 I will eventually construct 6 outer and 2 inner corners giving me a variety of layouts. Plus of course a gatehouse. 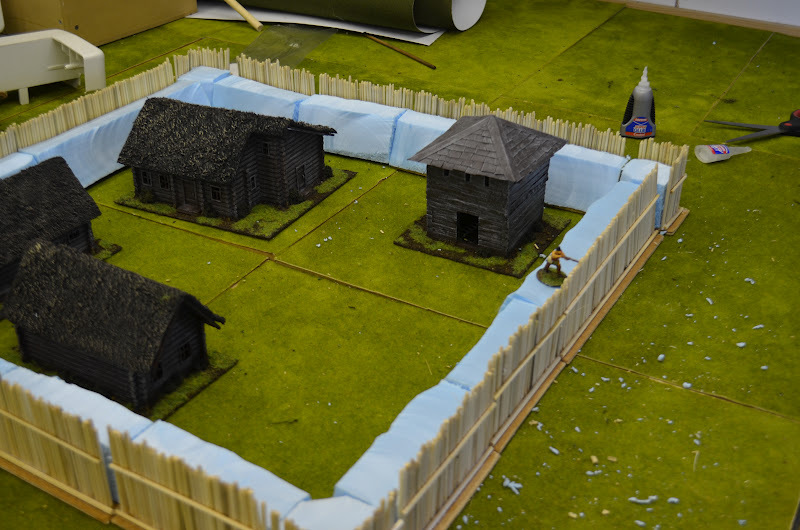 In total I plan to construct a total of 2.5 metres of stockade walls (inc Gatehouse). The bases were cut and sanded. These are made from hardboard. I use the rough edge facing up as it gives a better surface for glueing. 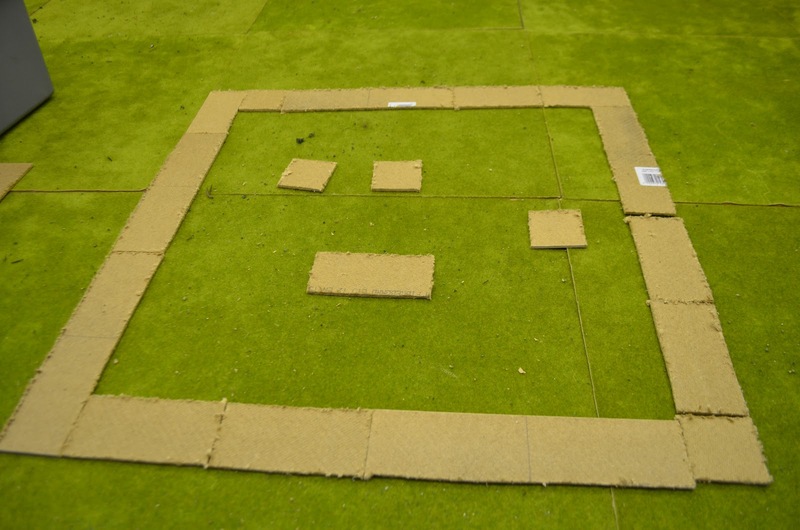 The photos below illustrate a basic fort pattern and have a few log buildings inside for scale purposes. With Buildings...authentic thatched buildings !! The walls themselves will be made from bamboo skewers. These can be found in most Superstores/Poundshops etc usually in their bbq sections -they typically retail around £1 for 100. Given that we are now entering the Winter season you might be hard pushed to find them instore now but there are good value sources on the internet. Each skewer is 30m long from base to pointy end. By having the height of the wall at 7cm ( just over twice the height of a 28mm figure per base) I can cut 4 x ‘upright logs’ from each skewer. The 7cm height scales up to a wall that is about 12 feet in height which feels about right. 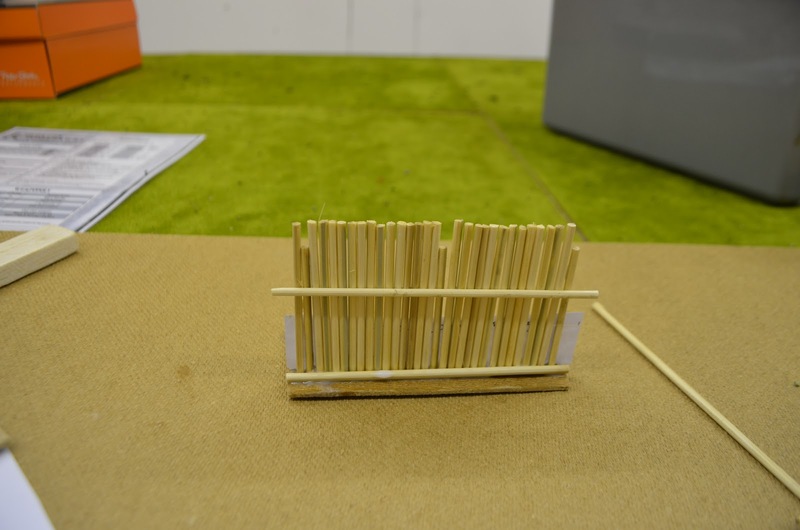 3m = 300cm divided by 14cm = 214 skewers. 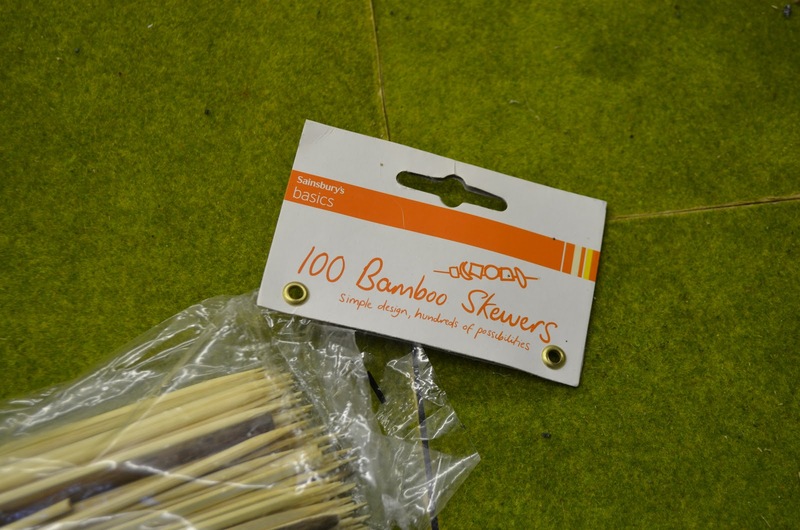 With cross spars, allowing for waste etc I reckoned I would need a total of 300 skewers. With the bases cut I started cutting the ‘logs’. Each log is slightly different in length as I didn’t want the construction to be uniform in height . The best tool for cutting the skewers was a set of really sharp garden pruners. I finally built a good batch of similar length ‘logs’. The next step was to give them their distinct rounded/pointed top – using one of my kid’s pencil sharpeners I tackled this mind numbing task with a glass of wine and some good music. Note don’t sharpen them to far as you will blunt the sharpener and weaken the bamboo. You could sand them down but it would take ages. I needed a frame to glue the upright logs onto. I simply drilled some pilot holes into the hardboard bases and pushed the bamboo skewers through the holes. These were fixed with PVA on both the under and top sides. NOTE. When drilling the pilot holes come in from the bottom side of the base that way the exit ‘wound’ of the drill will be in the top side. Failing to do this will mean that the bases will never be truly flat. With the upright spars dry glue two cross spars (cut to same length of base). The first I ran along the base of the wall the second about two thirds of the way up. Use a template to ensure that these second higher cross spars are all the same height. I used superglue for the cross spars as these would be the fixing point for the upright logs. Simply take the ‘cut logs’ dip in pva glue and lay on the frame. The skewers all come in variable widths so when I came to the end of a run it was just a case of picking the right width skewer to complete the wall. Leave these to dry for 24 hours. I reckon the walls you see in the following pictures took me about 7 hours in total to build. Spread over a week with each task completed before the next it really wasn’t that bad. The frame with uprights glued on. The next step was to think about the reverse side of the wall. I wanted to have a firing platform along the wall and at the same time I wanted to buttress the walls for strength. Fortunately I had two blocks of blue foam that were up to the job. These were first cut into a rough shape with a standard saw. Secondly I used my hot wire foam cutter to create the sloping reverse edge of the rampart. The firing platform is c2.5cm in width and stands at a height of around 5cm. The inner walls and the inside of the blue foam were then painted black before glued into place. This will save no end of trouble when it comes to the final pant job. Next up - creating the soil banks, painting and deckboards on the ramparts. With a bit of luck these should be ready in a week’s time....they have to be because the next game is on the 1st October ! Update: This is now finished. Click on link below to see the final pictures. Last night we managed to fight the second Muskets & Tomahawks game. I umpired again and prior to the guys arriving I set up the battlefield and the forces. The cards were shuffled and off we went. The following actions are not necessarily in sequence of play but give a flavour of the battle. We eventually went through the deck four times before the Morale cards (for both forces came into play). Side plots were rolled but these had very little bearing on what was a very fierce and bloody engagement. Observation: Whilst I remember we discovered another one of those little rules that appears to be tucked away but has massive consequences in game play. When units roll reaction tests (ie after casualties have been suffered) they roll a d6 and compare the score with modifiers to a reaction table based on their troop type. Last night I noticed that if a unit had less than three stands they only roll a d3. This means that those smaller units are even more likely to run & rout than a stronger force. Up til now we had only rolled the d6. This means our native Indians are even more fragile than before. 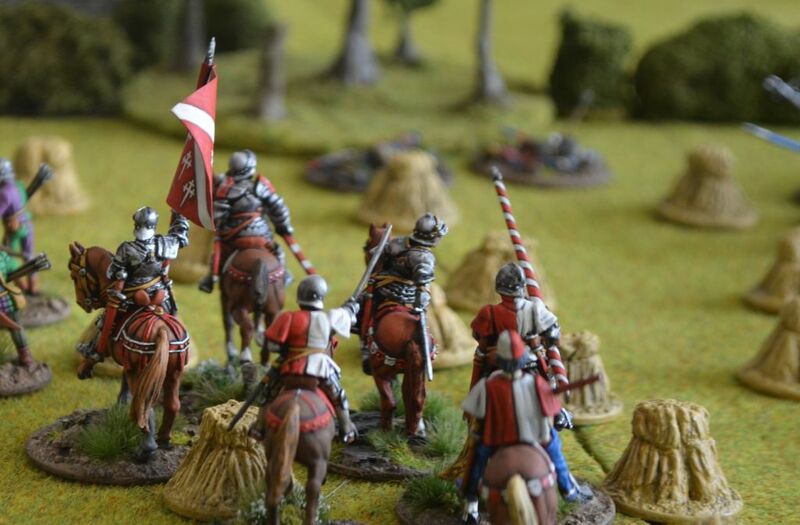 Observation: We also introduced the throwing weapons rules and great fun was had by the Natives throwing their weapons into the mass ranks prior to a charge. I need to check the rules but yesterday we decided that rather than roll reaction dice for any Tomahawk kills straight away we would add the impact of these to the final scores in the ensuing melee. This prevented the defending forces from running before combat. I have posted a question on the M&T forum to establish if you throw under 4” do you get +1 to hit bonus plus are reaction rolls made by defenders straight away or are the kills added to melee results? The Indians & Canadians quickly crossed the river and targeted the lone building to the south of Kings Creek proper. This was set on fire in rapid succession and the poor innocents soon scalped as they fled the scene. This flanking force then headed towards the settlement. Buildings need six actions to set on fire so if all six natives light the fire can this be done in one action? 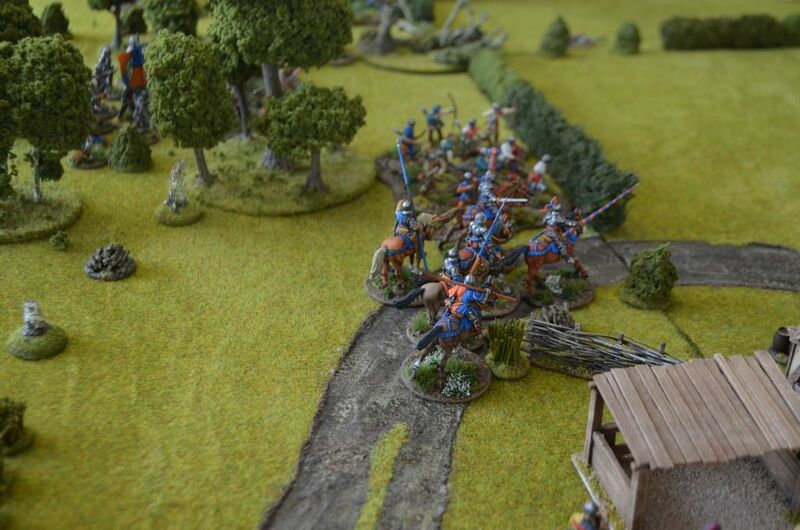 A crushing volley of fire from the two of the French regulars crashed into the advancing British line. 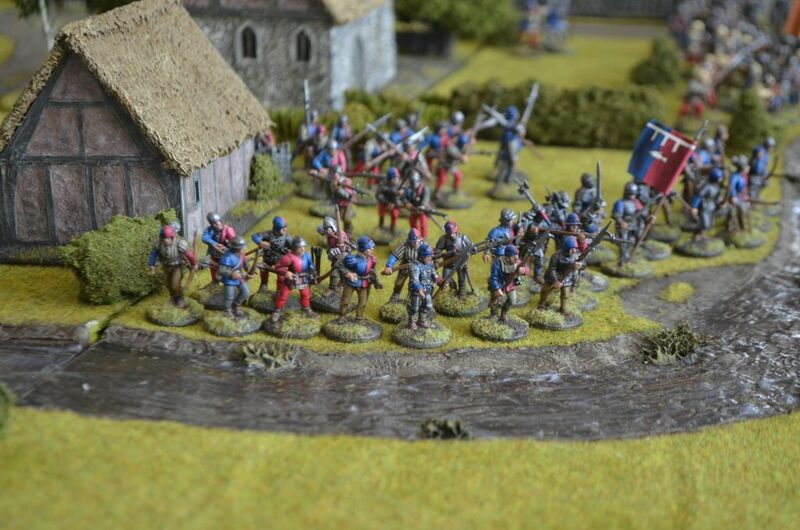 Capitalising on the two successive actions that regular troops get the French charged into the Redcoats. 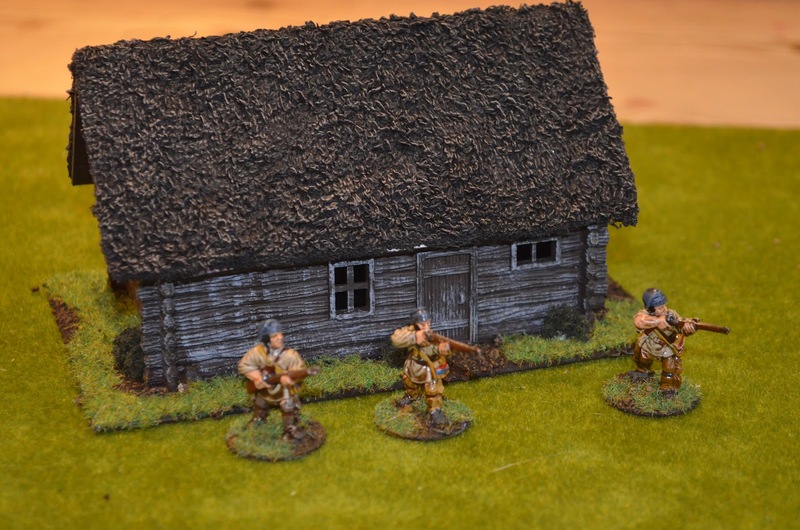 This is a really powerful tactic – the troops still need to reload but the thought of volley and cold steel got the British player very worried. Frantic hand to hand action over the next two phases of play ended up with the French winning albeit suffering casualties. 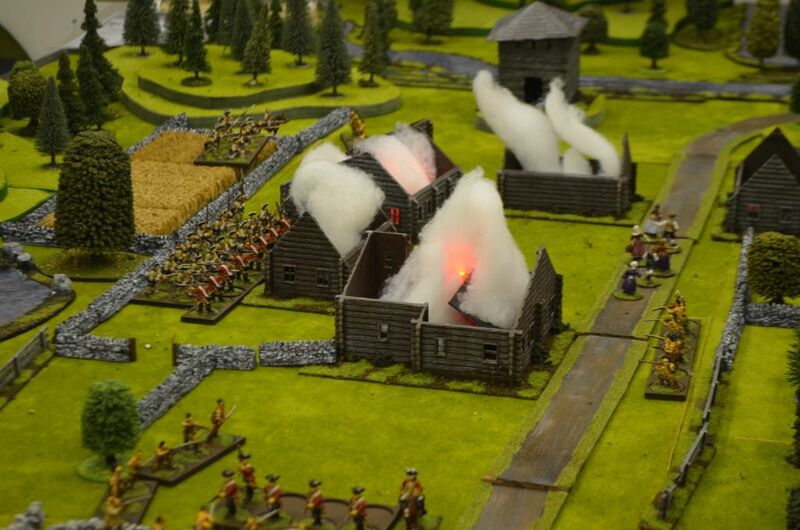 With both units of French troops against buildings fire soon took hold. Despite hiding behind the wall a volley crashed out. Half the force dropped and the rest of the men from the woods ran from where they came. The sharpshooter combined with firing lines at close range is deadly. Their Indian allies threw themselves desperately against the thin red line. Despite rising casualties the line held bravely to the last man, With more Indians quickly arriving on the scene the carnage was total. The Red jackets lay quiet and the village was open to slaughter. It was at this point the error of reaction dice (d6 vs d3) may have made a difference. However, like all good stories there was a twist in the tale, the French Commanding office had been tasked to be bold (side plot) – had he in been sight of the enemy for four consecutive actions and insight of his men. Yes he had. Net result a draw for both sides. A fitting result to the bloody encounter at Shed Creek. This 500 point aside game took just over two hours to play out. The game was rapid, thanks to having an umpire, movement trays for the figures and a sense of urgency. 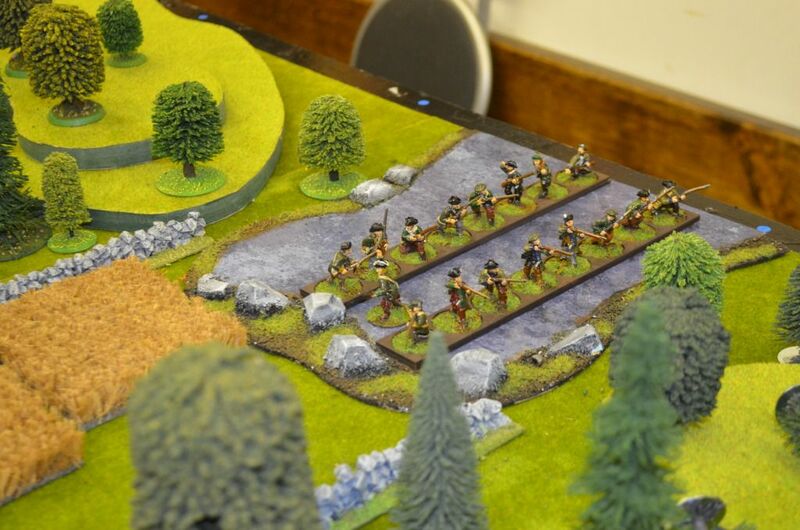 The movement trays work well for these big games and I’ll be looking to source some more irregular shapes at the next show I visit (Warfare ?). They also help to denote facing and formations. Stone Walls (aka Hard Cover) were vital for defending troops. Eventually I will replace many of these with wooden fences (light cover) . We didn’t use the hidden movement rules last night but I suspect the Indians may have been more effective earlier on if they could sneak up on the defenders. Likewise we didn’t use the officers as playing pieces - they just added bonuses to morale and the special officers card. All in all a great game and looking forward to the next one. Next week we are taking a break from the forests of 18th century North America and moving forward in time and further south to the hills of Virginia and the American Civil War. Finally managed to paint some regular French troops - stiill have to sort out some flags but at least I now have some foes for the British. next up - finish the Indians and those civvies.. When you think of the buildings in Last of the Mohicans you think of forts, log cabins and Indian encampments. Given that these tend to be the basis of strategic objectives in Muskets and Tomahawks an investment was going to be needed. 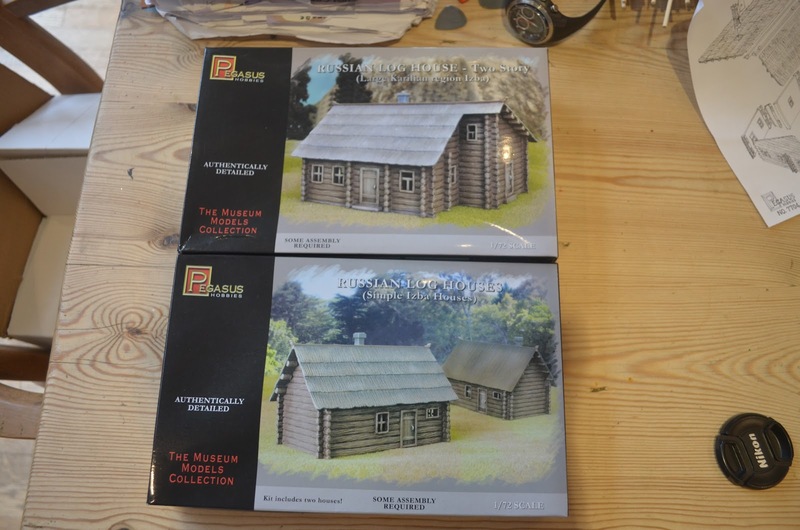 Having trawled the various forums I was drawn to a number of comments concerning the log cabins manufactured by Pegasus Hobbies. 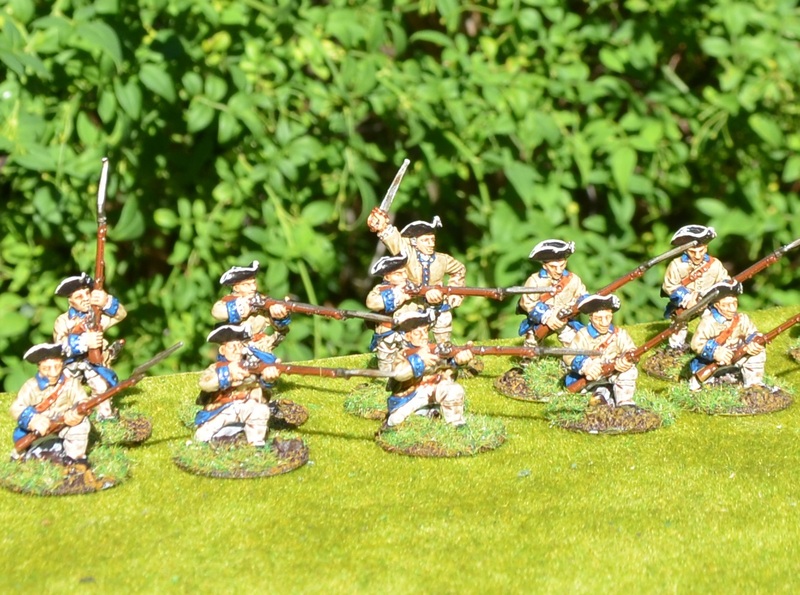 Although marked for the 1/72 scale they are perfect for 28mm. In addition they are cheap - two cabins for £10 is good value. They turned up in four days. Components of one log cabin - you get two in the box! 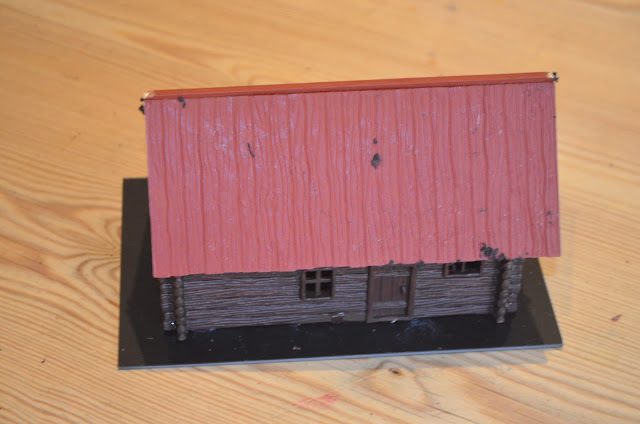 I hate the roofs, in the two cabin set you get one planked roof and one very cheap looking thatch roof. 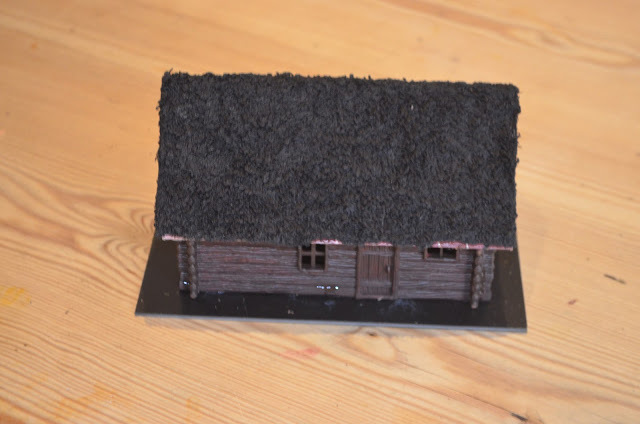 I wanted something more organic, and before I am shot down in flames (pardon the pun - yes I know thatch is no exactly the most defensive property in a building) I also wanted something that could double up for other games. So I decided the plastic roofs would go in the spares box and new ones would be constructed. 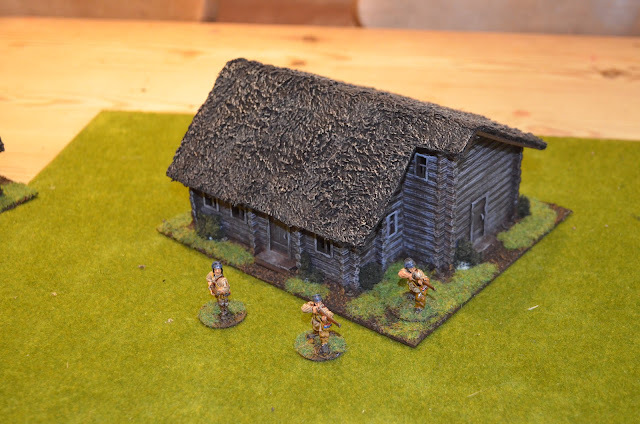 As a result I constructed new roofs from card and have covered in thatch (towelling). 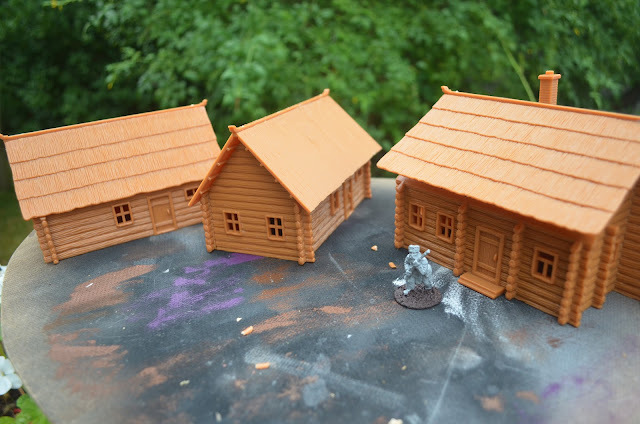 The old plastic roofs will be used for later conversions. Given that they have a plank effect they may be suitable for other buildings. The towelling thatch was bought black. This was a handtowel from Tesco at £3 and is enough to make at least 6 buildings worth. 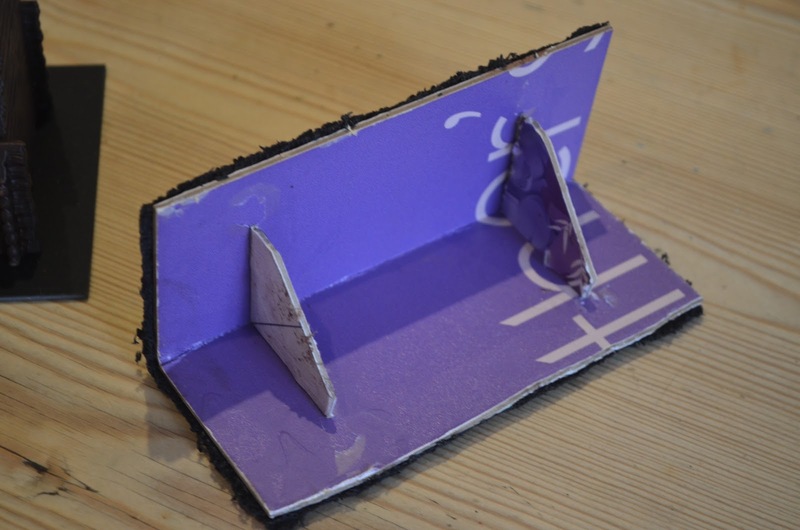 The towel is soaked in PVA and then stuck on the card roof - allow 48-72 hours for drying, then trim back to the card base. Paint the card base to match the building. Once all this is dry: drybrush with a light brown and highlight with bleached bone. The building itself is dry-brushed greys. The buildings themselves are mounted on plasti-card and the outer areas covered in grit, sand, paint, static grass and clump foliage. 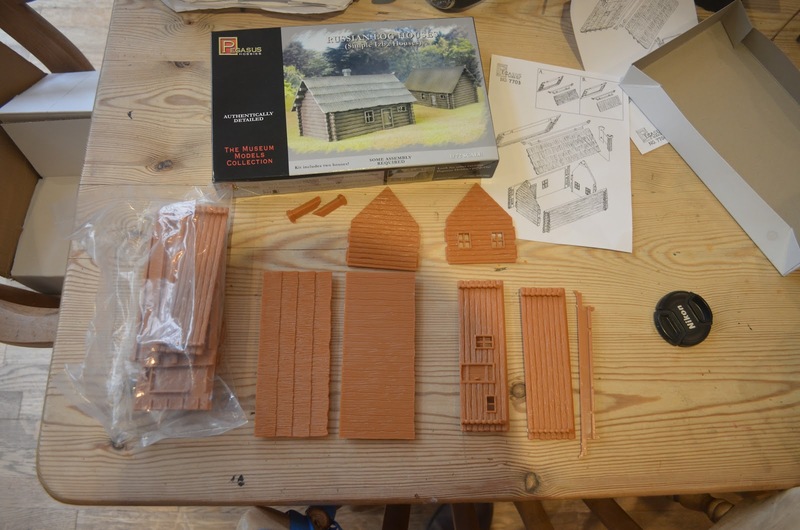 Internally I have just painted the buildings brown. 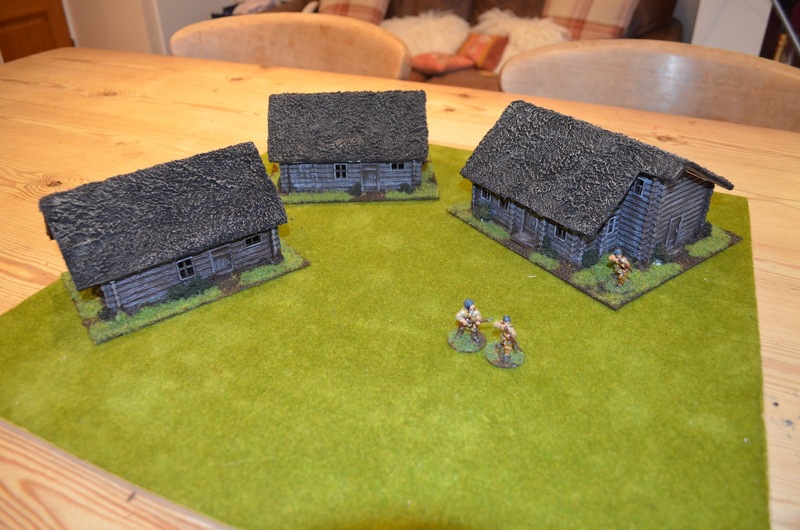 The models don’t haves bases so unless you want your tables base colour showing inside I strongly recommend a base. If I was inclined I could have ‘planked’ the floors but I didn’t. So for a bit of cash (much cheaper than some acrylic buildings) I had a few cabins for Muskets & Tomahawks.